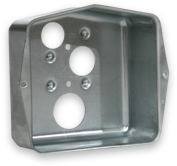 A leading manufacturer of USA-made hitches was looking for a more streamlined and safe process to produce stamped parts used in hitches. See their story below. PMI partnered with a leading supplier of USA-made steel hitches and towing products. This partner has a history of setting the standard in their industry for manufacturing capabilities, product innovation, and safety testing. They use the latest technology from cutting edge design software to advanced robotic welding. These tools and dedicated team members of this manufacturing company allow them be leaders with first-to-market designs and unmatched order-fill rate. This Trailer Hitch Supplier has seen great success with their products leading to high sales volume. With this success, they began to recognize their previous method of producing stamped parts by feeding steel bar product manually into a press was not very efficient or safe. They wanted to increase the safety for their team members, and reduce the floor space this type of production required. PMI partnered with this Trailer Hitch Supplier to take their existing tools and convert them to coil fed systems. With 15 plus coil fed stamping lines, PMI had more than enough capacity to run a variety of stampings for them. By moving the tools and stamping to PMI, the supplier was able to open up additional welding and assembly areas previously covered in raw material and work in progress. Converting the hand fed tools to coil fed reduced labor costs and improved throughput efficiencies. In the end, savings totaled more than $100,000. Interested in saving costs on steel supply, fabrication and manufacturing? Contact PMI today for steel fabrication solutions and local metal supply.